If you’re playing in your school band, trying out for jazz band, prepping for a competition or interested in learning for your own enjoyment come to Centre Music House for private Saxophone lessons! The Saxophone is a quintessential band instrument whose sound has been adopted to classical, contemporary, rock, pop, jazz and many more styles of music. 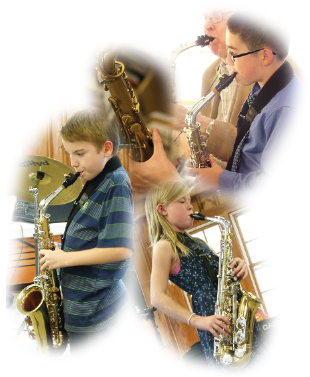 Our saxophone teachers offer lessons on the Alto, Tenor, Soprano, and Baritone saxophones. They can teach in a number of styles; jazz, pop, big-band, etc. Many of the books which they use to supplement lesson materials contain play-along CDs which enhance the learning experience and add a performance element to lessons and practice. As you progress through your saxophone lessons you and your teacher will explore more difficult keys and time signatures, dynamics, improvisation, and various styles of music for the saxophone such as Jazz. Our saxophone students range in age from 8 or 9 to adult. Start learning how to play the saxophone today! Don’t have a saxophone to play yet? We offer a rental program to beginner saxophonists as well as comprehensive repair service to keep the student’s instrument in top playing condition. For information about our repairs click here: Saxophone Rental.